MYBOYCHARLIE (IRE) (Bay 2005-Stud 2009). 4 wins-3 at 2, Deauville Prix Morny, Gr.1. Leading Sire of 2YOs in France in 2016. Sire of 600 rnrs, 351 wnrs, 17 SW, inc. Jameka (MRC Caulfield Cup, Gr.1), Sistercharlie, Euro Charline, Peggy Jean, (Sir) Charles Road, Charlie Boy, Blueberry Hill, Noblesse Oblige, Camprock, Cheikeljack, Zelady's Night Out, Landfall - Rise High (H.K. ), Siren's Fury, Salai - Skyrockets (H.K. ), Art of Raw, Sweet Charity, etc. Dansez (f. by Myboycharlie). 5 wins. See below. Jeram Future. 3 wins at 1200m, 1400m in Malaysia and Singapore, Singapore TC Class 4 H., 2d Singapore TC South Africa Trophy, Class 5 H., Class 4 H.-twice, 3d Singapore TC Class 4 H.
Steel Caps. Winner at 2000m in 2017-18 in Aust. Special Rain. 2 wins at 1100m, 1200m in 2017, Singapore TC Gold Rutile S., Class 5 H., 2d Singapore TC Class 4 H.-twice, 3d Singapore TC Class 4 H.-twice. Blonde Voyage. Winner at 1600m in 2016-17, 2d SAJC Angelakis P., Ubet P.
Gulf News (Woodman). 5 wins from 1650m to 2200m in France and U.S.A, Saint-Cloud Prix Bacchus, Maisons-Laffitte Prix Birum, 2d Longchamp Prix Niel, Gr.2, 3d Deauville Prix Ridgway, L.
Balsamine. 2 wins at 2, Chantilly Prix du Rond Alicante, 3d Longchamp Prix de la Cascade, 4th Saint-Cloud Prix Penelope, Gr.3. Half Moon Hotel (Alado). 5 wins-1 at 2-at 1200m, 1400m, R382,320, to 2016-17, Kenilworth Julie Killias H., Durbanville Emerald Cup, Kenilworth Book Your Table for National Womens' Day H., 2d Kenilworth Somerset P., L, Sophomore Sprint H., L, Barrecode Live H., 3d Kenilworth Mbokodo Winter Classic This Saturday H., 4th Vaal Riverside H., L.
BALANCHINE (Storm Bird). 4 wins. See above. ROMANOV (Nureyev). 4 wins from 7f to 1½m, £308,872, Newmarket Jockey Club S., Gr.2, Haydock Rose of Lancaster S., Gr.3, Sandown Tudor S., 2d Grand Prix de Saint-Cloud, Gr.1, Ascot Cumberland Lodge S., Gr.3, 3d The Derby, Gr.1, Canadian International S., Gr.1, Irish Two Thousand Guineas, Gr.1, Saint-Cloud Prix Eugene Adam, Gr.2. Sire. WEST WIND (Machiavellian). 2 wins at 2000m, 2100m, €575,151, Chantilly Prix de Diane, Gr.1, Prix de la Chapelle en Serval, 2d Longchamp Prix Vermeille, Gr.1, Prix de la Flandrie, 3d Curragh Pretty Polly S., Gr.1, Saint-Cloud Prix Nikellora. Producer. REDBRIDGE (Alleged). 3 wins at 10¼f, 1½m, Leicester Mercury S., L, 3d Ayr Doonside Cup, L.
THUNDER SNOW (Helmet). Champion 3YO Dirt Miler in UAE in 2016-17. 7 wins-2 at 2-from 1200m to 2000m, £135,518, €508,420, US$150,000, 28,002,100Dhs, to 2017-18 in GB, France and U.A.E, Meydan Dubai World Cup, Gr.1, Chantilly Prix Jean Prat, Gr.1, Saint-Cloud Criterium International, Gr.1, Meydan UAE Derby, Gr.2, Al Maktoum Challenge Round 2 S., Gr.2, 2d Belmont Jockey Club Gold Cup, Gr.1, Irish Two Thousand Guineas, Gr.1, Meydan Al Maktoum Challenge Round 3 S., Gr.1, Goodwood Vintage S., Gr.2, Doncaster Champagne S., Gr.2, 3d Deauville Prix Jacques le Marois, Gr.1, Royal Ascot St James's Palace S., Gr.1. IHTIMAL (Shamardal). 4 wins-2 at 2-from 1400m to 1900m, £157,649, 1,101,000Dhs in GB and U.A.E, Doncaster May Hill S., Gr.2, Newmarket Sweet Solera S., Gr.3, UAE Oaks, Gr.3, UAE One Thousand Guineas, L, 2d Newmarket Countryside Alliance Foundation 2YO Fillies' S., 3d Newmarket Fillies' Mile, Gr.1, The One Thousand Guineas, Gr.1, Royal Ascot Chesham S., L.
FIRST VICTORY (Teofilo). 2 wins at 2, Newmarket Oh So Sharp S., Gr.3, Turftrax 2YO Fillies' S., 4th Newmarket Pretty Polly S., L.
ALWAYS SMILE (Cape Cross). 4 wins-1 at 2-from 6f to 8¾f, £156,510, York Hambleton S., L, 2d Newmarket Sun Chariot S., Gr.1. WINTER LIGHTNING (Shamardal). 2 wins at 1400m, 1600m in 2017-18 in U.A.E, Meydan UAE One Thousand Guineas, L, 3d Sandown Atalanta S., Gr.3. HAVANA COOLER (Hurricane Run). 3 wins from 1500m to 2400m, £49,009, A$253,000 in GB and Aust, ATC Doncaster Prelude, Gr.3, 3d ATC Metropolitan H., Gr.1, VRC Lexus S., Gr.3, ATC Japan Racing Association P., Gr.3. TRUST IN A GUST (Keep the Faith). 10 wins from 1000m to 1600m, A$1,170,150, MRC Sir Rupert Clarke S., Gr.1, Toorak H., Gr.1, Harris Walker Gold Carat, Le Pine Funerals H., MVRC Chandler Macleod S., Ballarat TC Thomas Jewellers Gold Eureka Stockade, MVRC Jeep Don't Hold Back H., 2d MVRC Chandler Macleod S., L, VRC VOBIS Gold Reef S., MRC VOBIS Gold Sprint, Bendigo JC VOBIS Gold Rush 2YO S., 4th MRC Gothic S., L.
STAGE CALL (Sadler's Wells). 5 wins-2 at 2-from 1m to 9f, £19,374, US$253,275, Keeneland Hopemont S., L, 3d Curragh Futurity S., Gr.2. Sire. HUMILIS (Sadler's Wells). 3 wins at 1¼m, Cork Blue Wind S., L, 4th Curragh Blandford S., Gr.3. Producer. PHOLA (Johannesburg). 5 wins-1 at 2-from 1m to 9f, US$415,963, Churchill Distaff Turf Mile S., Gr.2, Tampa Bay Downs Hillsborough S., Gr.3, Gulfstream Park Allowance, 2d Belmont Just a Game S., Gr.1, 3d Arlington-Washington Lassie S., Gr.3. THADY QUILL (Nureyev). 5 wins-1 at 2-from 1400m to 1800m, £11,125, US$236,835, 125,100B$ in GB, U.S.A. and Barbados, Newmarket Superlative S., L, 2d Santa Anita Oak Tree Mile S., Gr.2. Sire. ROYAL DEVOTION (Sadler's Wells). 2 wins at 1¼m, 1½m, Galway Oyster S., L, 2d Leopardstown Trigo S., L. Producer. APRIL STARLIGHT (Storm Bird). 2 wins at 2, Leopardstown Silver Flash S., L, 3d Curragh Railway S., Gr.3. Producer. SHONAN MIGHTY (Manhattan Cafe). 4 wins-2 at 2-at 1800m, 2000m, 312,663,000¥, Hanshin Sankei Osaka Hai, Gr.2, 2d Tokyo Yasuda Kinen, Gr.1, Hanshin Sankei Osaka Hai, Gr.2, Naruo Kinen, Gr.3-twice, Osaka Jo S., L, 3d Hanshin Takarazuka Kinen, Gr.1, Tokyo Yasuda Kinen, Gr.1, Kyoto Kinen, Gr.2. GO FOR THE SUMMIT (Heart's Cry). 3 wins-2 at 2-from 1800m to 2400m, 76,856,000¥, to 2018, Tokyo TV Tokyo Hai Aoba Sho, Gr.2, 4th Tokyo Kyodo News Hai, Gr.3. Race Record: 19 Starts 5-4-2 A$82,100. 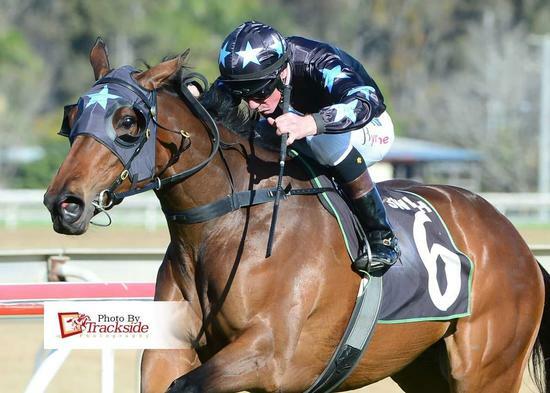 5 wins from 1100m to 1650m, A$82,100, to 2018-19, Ipswich TC Carlton Mid H., Buy 2018/19 Membership H., GCTC Industry Awards Night P., 2d BRC Gallopers Sports Club 2YO P., Keno 20 Year 2YO P.